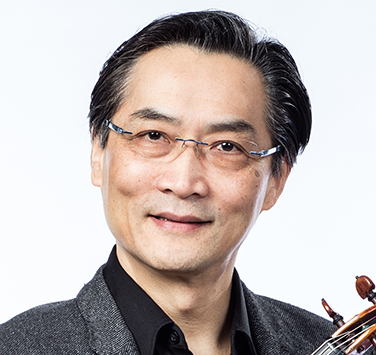 Violinist Yi Lee received his Bachelor of Music degree from the New England Conservatory in Boston in 1985. Prior to this he studied at the University of Illinois, the Midwest Institute, and the Shanghai Conservatory. Born in China, Yi was a member of the Shanghai Conservatory Symphony Orchestra and the Peking Zong-Zheng Symphony Orchestra before moving to the U.S. in 1981. His orchestral experience also includes the Los Angeles Philharmonic Institute Orchestra, the Boston Philharmonic, the Aspen Music Festival Orchestra, and the Nebraska Chamber Orchestra. As well as performing with Symphony Nova Scotia and the Singapore Symphony Orchestra, Yi has also toured widely as a guest violinist in Europe, North America, China, and southeast Asia. Yi is married to Symphony Nova Scotia violinist Anita Gao Lee, and together they have two daughters, Mimisu and Lala.